Should Gym Leaders be on Shoddy? This is a 15 day poll to decide that. I say Yes because there are so many people on this site that Shoddy battle! Perhaps there could be two gyms of each type - one on Shoddy, one on DS...... anyway I'm throwing ideas out there. 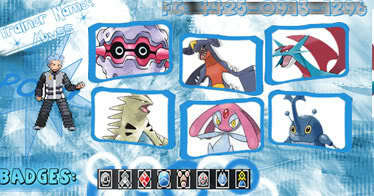 PLus, regarding the Elite 4, I think that there could be one on Shoddy, one DS again! Anyway - it's just a tiny idea and I'll try to come up with something else. There's a chance that you could start it on Shoddy (or have a try-out onshoddy) and then bring it back to DS. This way it would save you having to make a team - only to find out it isn't gym leader worthy...... Again - I'm just throwing some ideas out there! But what about the people (like me) that don't have Shoddy or can get it. Perhaps there could be two gyms of each type - one on Shoddy, one on DS...... anyway I'm throwing ideas out there. I actually don't think that Snoogy's idea is that bad myself. If this site started to in the next few weeks accumulate more people (which is currently is thus far) maybe we would have enough to have two different leagues, one on shoddy, and one on wifi. However, if we have to choose one of the other I would say wifi only because even though I prefer Shoddy I just think more people have access to wifi as opposed to shoddy. Although, I still think Snoogy's idea is pretty good. I actually like Snoggy's idea. We will try to work on it. I just think more people have access to wifi as opposed to shoddy. Should we have 2 separate leagues? We could have a Shoddy Gym Leader league and a Wifi. I would be on shoddy for a while because I don't have wifi. I think I might know 8people who already plan on being a gym leader on shoddy. Salice- ??? ?i don't know if he wants to but it would be a great idea if he did. It'd be easy to make but I need your suggestions people. Yes or no. Is it a good or bad idea? Yep - I totally agree, but then you can become the ultimate master of BOTH leagues! Man that would be great - oh and BTW my ground team is almost complete on WiFi! YAY for me! Subject: Re: Gym Leaders on Shoddy?